This ceramic glass GE cooktop offers a smooth and seamless cooktop surface that makes cleaning quick and easy, and two ribbon, 7-inch heating elements. With ribbon heating elements, the heat comes from brightly glowing elements positioned beneath the smooth surface. Even heat is directed straight up to the pan for high speed heat-up. It also offers a 9/6-inch heating element with PowerBoil that accommodates various sizes of pots or pans and speeds the boiling process. Whip up a feast with five radiant cooking elements - including a 9inch/7inch/5inch Power Boil element that boils water quickly and an 8inch/5inch dual element that accommodates multiple sizes of cookware while white LED backlit knobs add a touch of sophistication to the kitchen. The 21 1/4-inch GE Built-In Electric Cooktop makes a wonderful addition to any kitchen space thanks to its reliable features and sleek stainless steel finish. Cook all of your favourites quickly and easily with the two coil heating elements that offer removable one-piece drip bowls for simple cleaning. 30" Smoothtop Electric Cooktop in Stainless Steel with 5 Elements including 6"/9" Power Boil This ceramic glass GE cooktop offers a smooth and seamless cooktop surface that makes cleaning quick and easy, and two ribbon, 7-inch heating elements. With ribbon heating elements, the heat comes from brightly glowing elements positioned beneath the smooth surface. Even heat is directed straight up to the pan for high speed heat-up. It also offers a 9/6-inch heating element with PowerBoil that accommodates various sizes of pots or pans and speeds the boiling process. 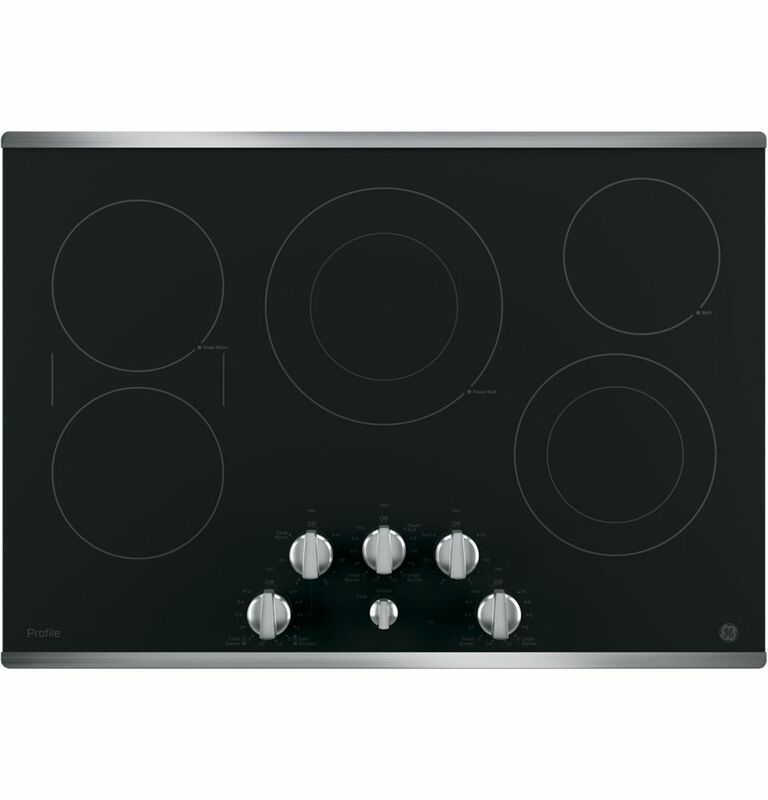 30" Smoothtop Electric Cooktop in Stainless Steel with 5 Elements including 6"/9" Power Boil is rated 4.1 out of 5 by 96. Rated 4 out of 5 by NormandQuiTaime from Good cooktop, tremendous heat. Don’t place a dinner plate on the « keep warm » burner, it will break. Settings around the dials are hard to see. The dials’ red glow when turned on is pretty, but does nothing to illuminate the dial settings. Otherwise it’s a great cooktop. Rated 5 out of 5 by Wesley from It works great. Heats up fast and is very easy... It works great. Heats up fast and is very easy to clean. Rated 4 out of 5 by Spunky from I really do not like the knobs front and center.... I really do not like the knobs front and center. I wish I had purchased the touch model with no knobs. They are a pain to clean around. I love the way the GE Profile burners work. Rated 5 out of 5 by Trinihoya from Replaced an older model GE Profile. Fit was perfect.... Replaced an older model GE Profile. Fit was perfect. Easy to connect wiring. Works so far. Rated 1 out of 5 by Linda from I’m so sorry I purchased this cooktop. I cannot... I’m so sorry I purchased this cooktop. I cannot see or read any of the controls because they are so faintly written on the glass. For some reason I thought they would light up or be backlit when the burner was turned on, but not so. Horrible design. Rated 5 out of 5 by Po from Works great looks great!!... Works great looks great!! Rated 2 out of 5 by Laney2 from burner ctrl location bad, no bridge - really? There's nothing wrong with the way the stove cooks, but I HATE the location of the burner controls. Why in front? Also, what good is the sync burners control when there's no heat coming from the middle of them. Geez, I could easily control the two burners without the sync burner control. I really miss my "bridge" from my last GE stovetop where I could sear large cuts of meat in my very large rectangular pan. The sync control is absolutely useless. Last but not least, I do not need 5 burners. I'm a big cook, but 4 burners are quite sufficient. I own a double oven, a microwave, a slow cooker, so it's rare for me to even need 3 burners. It's fairly easy to clean but would be a lot easier if the controls were on the side as on your previous models. I just don't understand why you would try to fix something that "ain't broke." Overall, I'm very dissatisfied with this model cooktop.